Multi-strain probiotic and lactic ferment complex (9 strains). Formula based on natural strains of Bifidobacteria (residing in the colon) and Lactobacillus (residing in the small intestine), thereby ensuring complete intestinal tract coverage. Each capsule contains 5.5 billion active cells, concentration guaranteed until expiry date. Maltodextrin, vegetable capsules (hypromellose), inulin (prebiotic), magnesium stearate, titanium dioxyde, ascorbic acid. Probiotics that help support gastrointestinal health. ADOLESCENTS (12 YEARS OLD AND OVER) AND ADULTS: Take one capsule twice a day at breakfast and at dinner. Take at least 2-3 hours before or after antibiotics. * This product does not contain any priority allergens including: gluten, soy, dairy, peanut, tree nuts, sesame, eggs, fish, shellfish, wheat or sulphites. You are planning a trip and have already set the itinerary, imagined the content of your suitcase and taken the necessary precautions to ensure a safe trip? Whether it's an escape for leisure or a business engagement, plan ahead by bringing along probiotics specially designed for the occasion. Exposure to foreign bacteria, consumption of contaminated water, unsafe foods and limited hygiene measures explain the risk of "turista" among North Americans. More than half of overseas Travelers suffer from diarrhea, particularly those visiting the Middle East, Asia, Africa and Central and South America. How to take Probaclac Travelers ? One week before departure, take Probaclac Travelers to prevent digestive hiccups. Its multi-strain formula diversifies your bacterial profile to better deal with pathogenic bacteria in other regions of the globe. It also contains the strain Lactobacillus plantarum which is an anti-diarrhea. For those who have a regrettable tendency toward constipation while traveling due to dehydration and long sitting hours during transport, our supplement regulates intestinal transit in order to avoid blockage. 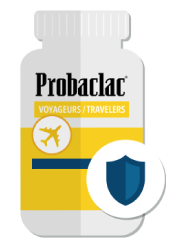 Take the Probaclac Travelers probiotics during your stay as well as during the week following your return in order to maintain an optimal intestinal flora. 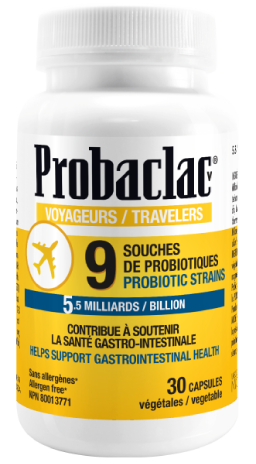 Can Probaclac Travelers help me if I have intestinal problems during my trip ? Stay up to date and know everything about our probiotics. You will shortly receive a confirmation email, if you do not see it, please check your unwanted mailbox and add the mailing address to your contacts to make sure you receive our messages. © 2019 Nicar Laboratories. All rights reserved. This content is exclusively meant for Canada.